HOUSTON, Texas (FinalCall.com) - BP is not the only oil tycoon facing pressure these days. A coalition of leaders traveling from as far as Australia, Burma, Nigeria, Ecuador and Alaska and authors of a new report,“The True Cost of Chevron: An Alternative Annual Report,” were ignored by Chevron CEO John Watson when they tried to hand deliver their report at the company's office here. Amazon Watch Corporate Campaign Director, and Chevron shareholder, Mitch Anderson is forcefully removed from Annual Shareholder meeting on May 26 after Chevron denies his legal right to speak at the meeting. The scene turned chaotic at the company's annual shareholder's meeting on May 26 as protestors were denied access, sat outside in locked arms and even blocked a building exit in an act of civil disobedience. Five were arrested by the Houston Police Dept. and eventually released for bringing attention to what they call human rights abuses and global environmental destruction by Chevron. 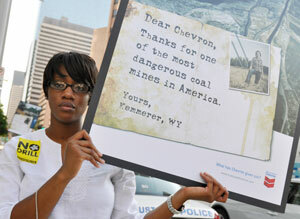 “Chevron refuses to face its own true cost. Community and Indigenous leaders came from around the world,” said Antonia Juhasz, lead author of the report. Protester outside the Chevron Shareholder meeting on May 26 in Houston, TX. shareholders meeting to speak out but was forcibly dragged out as others chanted “Chevron Lies, People Die!” This caused Mr. Watson to abruptly end the meeting. Ms. Juhasz and the other four were released from jail on May 27. 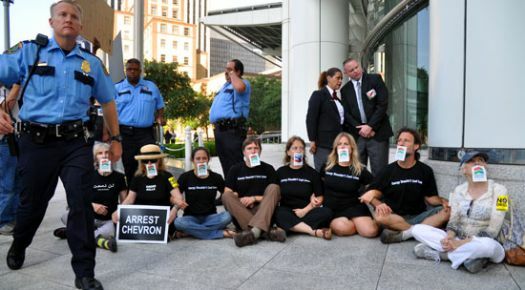 The other arrestees were Juan Parras of Houston; Reverend Ken Davis of Richmond, Calif.; and Mitch Anderson and Han Shan of San Francisco, Calif.
“Chevron cannot silence the truth about its operations in Houston or anywhere else,” said Mr. Parras. “I am confronted daily by people who are looking around their own communities and out across the world with new-found attention to the deep costs paid every day for our oil addiction,” said Ms. Juhasz. According to the report, Chevron is the 2nd largest U.S. oil company. Last year the company's profits exceeded $10 billion and its first quarter profits in 2010 was double that of 2009. (L)Emem Okon, of the Kebetkache Women Development & Resource Centre in Nigeria, speaks outside Chevron's Houston office during a May 25 press conference. (R)Antonia Juhasz, lead author of ‘The True Cost of Chevron: An Alternative Annual Report' speaks outside Chevron's Houston office during a May 25 press conference. Authors of the report issued some alarming national and international findings: For instance, Chevron's refineries in Richmond, Calif., have residents inhaling more toxic air inside of their homes than outside. In 2008, another one of the company's California refineries released a total of 862,304 pounds of toxic chemicals into the air. “I represent an area where there is no beauty shop, groceries, or cleaners. Our industry is Chevron. My people breathe their contamination every day and are constantly sick. Our health is not for sale,” said Rev. Davis. The impact by Chevron on the quality of life of citizens has been just as bad in Southern states according to the report. The U.S. Environmental Protection Agency reported more than 1.6 million pounds of toxic waste from Chevron's Pascagoula, Miss., refinery in 2008, including 46 different toxic substances. In first two months of 2010, Chevron's Texas operations were found to have committed violations including the unauthorized releases of tens of thousands of pounds of toxic compounds. In 2009 the operation was assessed nearly half a million dollars in fines for air quality and industrial hazardous waste violations, the report says. The report further notes that Chevron is the largest leaseholder in the Gulf of Mexico and less than two weeks prior to BP's recent drill ship explosion, 18,000 gallons of crude oil spilled from a Chevron operated pipeline in the Delta National Wildlife Refuge in southeastern Louisiana. “The communities most directly harmed by oil's abuse are organized, networked and ready. The public is roused, angered and ready to act. The oil corporations are on notice: the true cost of their operations is simply too great to bear,” said Ms. Juhasz. T.J. Buonomo, a former U.S. Army military intelligence officer and a member of Iraq Veterans Against the War, challenged Mr. Samson on Chevron's practices lobbying the Iraqi and U.S. governments to allow oil extraction in Iraqi soil while it remains under military occupation. 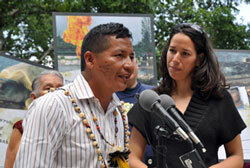 Guillermo Grefa, from the community Rumipamba in Ecuador's Amazon rainforest speaks at the May 25 press conference, while Change Chevron Campaign Director Maria Lya Ramos translates. The Amazon Defense Coalition is suing Chevron in Ecuador for $27.8 billion, alleging that the company knowingly dumped vast amounts of oil waste in Ecuador's rainforest from 1964 to 1990. “Over 18 billion gallons of toxic waste were dumped in rainforest soil, rivers, and groundwater. 30,000 people are suffering a wave of cancers, birth defects and miscarriages,” the report says. “When are you going to clean up what you have contaminated?” Guillermo Grefa of Ecuador asked Mr. Samson. “Chevron's CEO John Watson has said that he is ‘humbled' by BP's explosion in the U.S. Gulf. Instead, he should be ashamed of his own company's offshore operations which cause persistent, ongoing, daily abuses of the environment, our livelihoods, and public health,” said Elias Isaac of the Open Society Initiative for Southern Africa in Angola. For more information on the True Cost of Chevron Network visit http://www.truecostofchevron.com/.